One of the most important factors related to automated tests is “Maintenance”. A lot of effort is spent on maintaining the tests than writing actual tests. A recent study suggested about 30% of testers time is spent on maintenance.This leads to wastage of valuable time and effort by the resources, which they could have rather spent on testing the actual application. Imagine a world where the software can maintain tests without human interaction? This world has become a reality with Testim.io. We use Artificial Intelligence (AI) underneath the hood, which provides self-healing maintenance i.e problems are detected by the AI and automatically fixed without human intervention. The screenshot feature explained in the “Authoring and Execution” section helps users to know what was the baseline image and what was the actual image found. One of the most time consuming aspects of testing is after finding a bug, we need to report it to the developer with relevant information, to speed up the troubleshooting and fixing of issues. With Testim.io you can do this with a single click with the help of our chrome extension. All the details related to the bug are automatically generated for you. We put in a lot of effort to document most of the features of the tool in our User Documentation found under the “Educate” tab. With the above features, Testim.io helps to create stable tests that are highly maintainable. One of the good practices of writing automated tests is creating reusable components that can be used in different parts of our test suite. Testim.io helps to ensure Reusability by “Grouping” and “Parameterization”. Any number of related steps can be grouped into one reusable component. Our platform gives the option of testing application through various input combinations via Parameterization. Another important aspect of automation is building your tests such that it is extensible. As the product and teams grow, there will be need to test more complex functionalities which would require building upon already existing tests. This being the case, the automation suites need to be simple, understandable and should be easy to add more tests to already existing test suites with low coupling and high cohesion. For Example – Say we want to validate the “Select Destination” button from our previous examples. The way to do this would be. The above features help to make the automation suite more reusable and extensible. Authoring and Execution of tests is an important aspect of test automation. Tests should be simple to write, understand and execute across projects. The automation framework or tool chosen should give the flexibility to record and playback tests as well as, write custom code to extend the functionalities of the automation framework. This is where Testim.io can help you out. We follow a Hybrid Approach and make authoring and execution of tests really simple in such a way that both technical and non-technical members can collaborate and start writing automated tests quickly. This is achieved with the use of “Dynamic Locators”. The Artificial Intelligence (AI) underneath the platform in real time, analyzes all the DOM objects of a page and extracts the objects and its properties. Finally, the AI decides the best location strategy to locate a particular element based on this analysis. Due to this, even if a developer changes the attribute of an element, the test still continues to run and this leads to more stable tests. As a result, the authoring and execution of automated tests are much faster and more stable. As we can notice from the above image, the AI parses through all the DOM objects, lists them in the Properties Panel along with the rankings of each and every location strategy for that particular element. In this way, even if the attribute of an element changes, the AI can use a different location strategy from the already parsed list of DOM objects. Thus, the user does not have to worry about flaky tests. Some of the basic authoring and execution features Testim.io provides to its customers, are explained below. Once we click the “Record” button, we can record different user actions in our application. After recording different actions, click on “Stop Recording” button to finish recording our tests. Use the “Save” button to save the tests. While each test is recorded, the platform takes screenshots of all the Pass and Failed results of each and every step. As a result, users find it easier to troubleshoot problems and understand what happens underneath the hood. The way we create labels is by clicking on the “Label” button and either select an existing a label or create a new one. With the above features, Testim.io helps to make the authoring and execution of tests really fast and simple for our users. Within a matter of seconds a user can record, replay and save the tests. This is surprisingly one of the most overlooked aspects of test automation and our platform takes care of it for our users. According to the 2017 Test Benchmark Report, survey respondents want to achieve 50%-75% test automation. Join this round-table discussion with Alan Page, QA Director at Unity Technologies and Oren Rubin, CEO of Testim as they discuss what companies need to start doing now to achieve their 5 year testing plans. Do you need to validate data that appears in the app against data from your back-end? Do you need to extract data to use in your tests? Then we have the feature for you. API action – Will be used when in need to get data and use it for calculation, or to save it for later use in the test. Validate API – Will be used to validate an element against the API result data. We’ve learned that enriched debugging can be a huge time saver. Debug the console errors and network errors automatically and see the failed steps in the DOM. You can see in each step all the parameters used during the run. Large enterprises need the ability to manage multiple projects and various groups inside their organization. 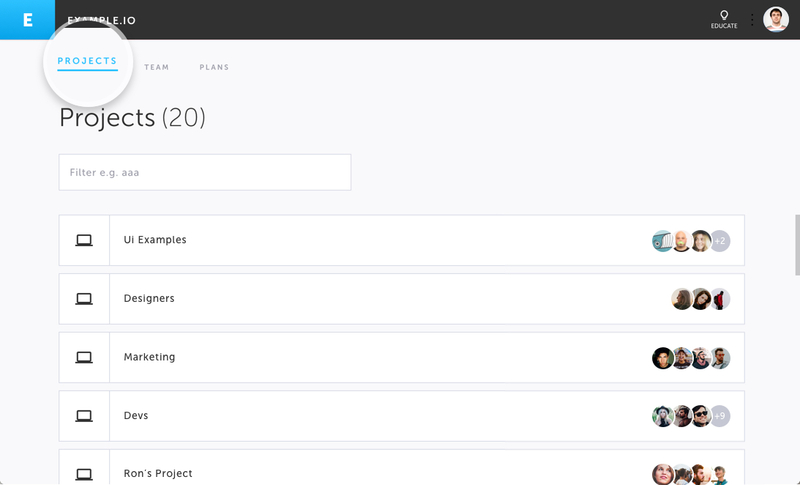 This feature makes it easy for admins to grant individual users access to specific projects. Earlier this year we’ve added support for a company structure with a company owner managing permissions and owners per project.